Natalie Wood, senior policy analyst with the Bell Policy Center, testified to the House Business Affairs and Labor Committee in support of FAMLI and Colorado paid leave. The Bell supports HB 18-1001, which creates the Colorado Family and Medical Leave Insurance (FAMLI) program in the Colorado Department of Labor and Employment. Under the plan, paid family and medical leave would be available to nearly all workers. After making premium payments through income deductions, workers could receive partial wage-replacement benefits to take leave from work for caregiving or for a serious health condition. A state-sponsored paid leave policy like FAMLI will ameliorate a major force impacting economic mobility in Colorado — our changing demographics. Colorado’s population is growing older. Every eight seconds, someone celebrates a 65th birthday, and by 2030, 1 in 5 Coloradans will be over age 65. As we highlight in our recent report on economic mobility in Colorado, most workplace policies are not keeping up with what this means for today’s workforce. More workers will need paid time off to care for themselves and for others. Because of this demographic shift, and because of the ripple effects of the Great Recession, older adults are remaining in the workforce past the traditional age of retirement. In fact, workers over age 55 comprise the fastest growing segment of the labor force. Older adults are more likely to have chronic diseases or disabilities, and thus may need time off for their own serious health needs. A recent analysis of FMLA data finds older workers take more leave than younger workers, particularly for self-care. If that leave is unpaid, which is disproportionately the case for workers with lower levels of income and education, it sets them up for economic distress just when they might be prepping for retirement. Additionally, an increasing aging population places greater demands on unpaid caregivers. At least half a million Coloradans are acting as an unpaid caregiver to someone age 50 or older. The majority of these Coloradans are also in the workforce. Population trends show the ratio of family caregivers to older adults is shrinking. As sources of family support dwindle, caregivers would benefit from better workplace supports or a Colorado paid leave program. Informal caregivers generate value to the people they care for, to the economy, and to the state budget. They enable their loved ones to retain independence, remain in their homes and communities, and even lend them financial help. They contribute $7.7 million to Colorado’s economy annually, according to AARP. Without unpaid caregivers, many older Coloradans would have to spend down their assets and rely more heavily on the Medicaid program, which covers nursing home and home-based care for seniors. One study finds those over the age of 70 who receive care from a family member at home are less likely to need nursing home care over the following 2 years. By 2030, the Colorado Futures Center projects one in five Medicaid dollars will be spent on adults age 65 and older. Imagine what that figure might rise to without the support of informal caregivers. Unfortunately, a lack of Colorado paid leave policies takes a toll on these Coloradans and their workplaces: Analysis from the Colorado Health Institute shows those caring for older adults shouldered $3.7 billion in workplace-related costs in 2015. Caregivers’ future financial stability is also at risk because they cannot save for retirement, per a study by MetLife. They face health costs, as they are more likely to have chronic diseases, substance use disorders, and depression. Colorado employers also shoulder costs as well, due to absenteeism, presenteeism, turnover, and increased health costs for their workers — costs that are projected to rise to $1.1 billion by 2030. This is precisely why the state’s bipartisan Strategic Action Plan on Aging (SAPGA) has urged the General Assembly to “establish family leave policies that set standards for compensating (these) employees.” As a proud participant in SAPGA, the Bell is glad to see FAMLI once again up for consideration. 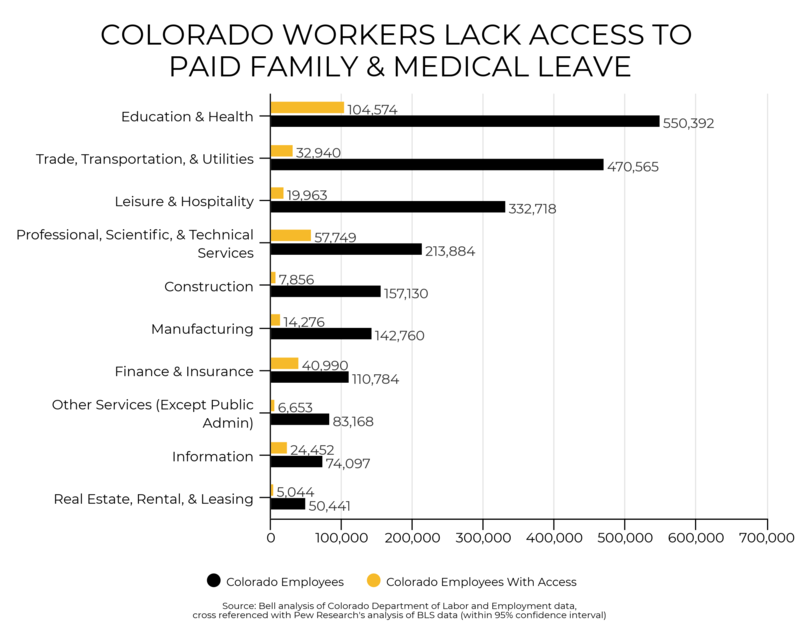 It’s not just commissions and policy wonks like me that think a Colorado paid leave program is a good idea. Lawmakers in five other states and D.C. have blazed a trail for our state to follow. Many polls demonstrate widespread public support for these policies, particularly as a strategy to help people afford the costs of long-term care. Colorado families face less of a balance and more of a balancing act when it comes to work and caregiving. Nearly all of us have needed or will need time off to care for others, or ourselves, and most of us work, but very few of us have access to paid family and medical leave. This bill creates a commonsense solution to this problem. The benefits of a policy like FAMLI are wide-ranging, enabling greater economic mobility, improving workplace productivity, and leading to better health outcomes for workers and their families. Thank you for the opportunity to be here today and thank you for Representatives Winter and Gray for sponsoring this bill. I’m happy to answer any questions.